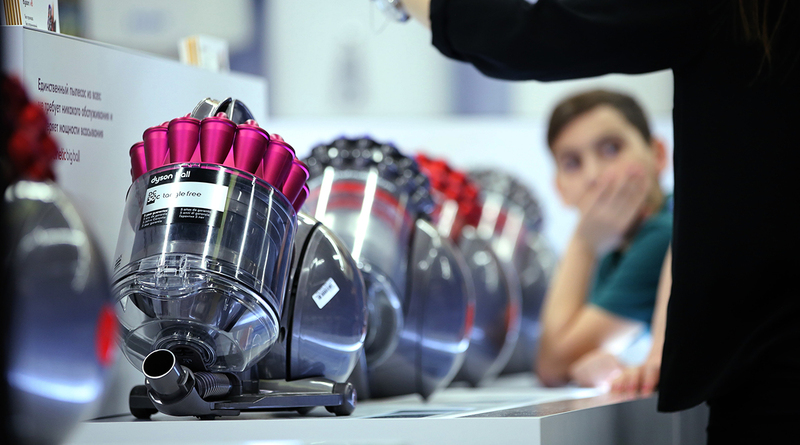 Dyson Ltd., best-known as a manufacturer of vacuum cleaners, hand driers and air filters, posted a surge in revenue driven by demand from Asia, and revealed a growing shift toward developing autonomous products. Founder James Dyson said the U.K. company — with headquarters based in rural England — has seen its “center of gravity” tilt toward Asia, which last year generated almost three quarters of revenue growth. Revenue increased 40% to 3.5 billion pounds ($4.8 billion) in 2017, while earnings before interest, tax, depreciation and amortization increased 27% to 801 million pounds from a year earlier, the company said March 1 in a statement. Continued growth will help fund the company’s bid to build an electric car by 2020. Dyson revealed plans in September to initially invest 1 billion pounds to develop the project. The company had already pledged to spend the same sum on solid-state batteries, with Dyson expecting overall expenditures to increase. Dyson declined to comment on any details of the car, but hinted it will involve a range of autonomous technology, such as the company’s 360-degree camera currently used in its robotic vacuum. “We’re trying to build products that do what they do automatically,” he said, adding that he wanted to speed up the rate at which the company’s products are autonomous, such as eliminating the need to manually switch them on or off. The company has yet to decide where manufacture the vehicle, with locations in the U.K. and Asia being considered. Over the past year, the number of Dyson staff working on solid-state battery technology has doubled, and the company is looking to fill more than 300 vacancies to work on the new vehicle. The company has also shifted its expertise, now hiring more employees with software skills compared with its traditional focus on hardware, Dyson said. A particular area of emphasis is those with a background in artificial intelligence, however finding people with enough skills in the field “is a big problem,” he said. While much of the attention on Dyson last year focused on the car, the company rolled out new versions of its cordless vacuum and is planning to announce a new product. Much of Dyson’s success in Asia has come from its range of air purifiers. In January, it announced a partnership with a Chinese standards group, and noted in its 2017 results that Shanghai is the top-selling city for its purifiers. Jim Rowan, who took over as CEO in October after the departure of former head Max Conze, is now permanently based in Singapore, the company said in the statement.